I shoot with a Canon 700D and I've just bought myself a Sigma 105mm 2.8 Macro lens. I've been loving the new lens but one issue I have is that the depth of field in the live view on the camera's screen does not seem to be accurate. For example, if I change from f/2.8 to f/5.0, the depth of field on the screen doesn't seem to change at all, but when I actually take the photo, it's clear the the depth of field has increased. I'm just wondering whether I should expect the depth of field to change on the live view as I change the aperture or if this is just something I have to work with? It kind of makes it hard to know what the outcome of my shot is going to be, which with macro can mean the difference between getting a shot of an insect and not (because it's gone by the time you evaluate the exposure and adjust the aperture). The camera usually keeps the aperture open as wide as possible while framing the shot. It is only closed to the setting you dialed in when the picture is being taken. This allows for a brighter viewfinder and more of the auto focus points to be used. 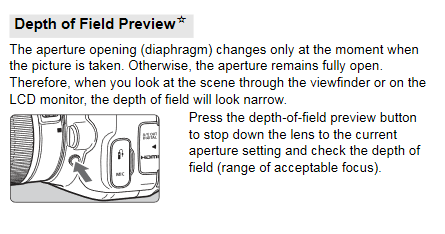 As described in the manual of your camera on page 114, there's a dedicated button to stop down the aperture to the dialed in setting. Not the answer you're looking for? Browse other questions tagged canon macro depth-of-field live-view canon-700d or ask your own question. Why do we need a DOF preview button? In live view, why does my aperture open before and after a picture? Is it possible to get a larger screen for live view, for precise manual focus? How does sensor size impact depth of field and diffraction for macro photography? Will a Canon MP-E 65 provide more depth of field than a reversed lens?